Deputy attorney general Rod Rosenstein and former FBI deputy director Andrew McCabe reportedly had a tense standoff after Robert Mueller was appointed as special counsel for the Russia investigation. The two men reportedly urged each other to recuse themselves from the Russia probe. During one exchange, Rosenstein is said to have pointed to a picture of McCabe wearing a political campaign T-shirt supporting his wife’s run for Virginia state Senate. McCabe in turn criticised Rosenstein and pointed to a memo he wrote for President Donald Trump, in which he criticised FBI Director James Comey and added justification for Trump’s firing of Comey. A rift between deputy attorney general Rod Rosenstein and former acting FBI director Andrew McCabe ran deep after Robert Mueller was appointed as special counsel over the Russia investigation, according to a Washington Post report published Wednesday. After Mueller was appointed in May 2017, McCabe was summoned for a meeting that included the special counsel and Rosenstein, current and former officials said to The Post. During this tense meeting, Rosenstein and McCabe reportedly cited several reasons why the other ought to recuse himself from the Russia probe. Some of the details of the meeting are disputed, but one person familiar with the situation said Rosenstein referenced a picture of McCabe wearing a T-shirt supporting his wife’s campaign for the Virginia state Senate race in 2015. Critics, namely President Donald Trump, have railed against the McCabe’s and alleged that their ties to the Democratic Party tainted the FBI’s investigation into Hillary Clinton’s emails. Alex Wong/Getty ImagesFormer acting FBI director Andrew McCabe. McCabe brought documents from FBI ethics officials that claimed he followed ethics rules, according to two people cited in The Post. But another person denied that the dispute was over a T-shirt and claimed that McCabe’s statements following the controversial firing of FBI director James Comey were scrutinised by officials. As Rosenstein argued his case, McCabe reportedly pulled out the deputy attorney general’s memo that Trump used to justify his firing of Comey. Legal experts have argued that this memo, which criticised Comey’s handling of the Clinton investigation, was the catalyst for Comey’s firing. “Andy was angry,” a person familiar with the events said to The Post. 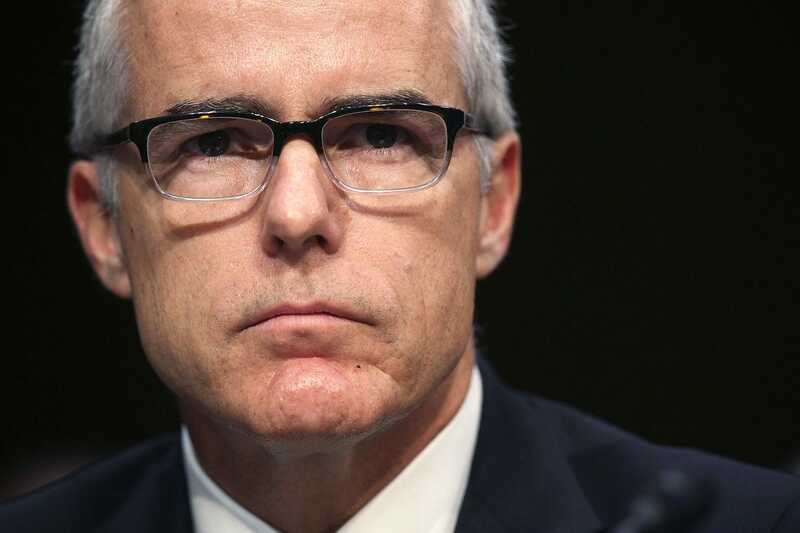 McCabe was fired in March, one day before his retirement date, after an internal investigation on unauthorised media disclosures surrounding the FBI’s probe of Clinton’s emails. Rosenstein is currently the acting attorney general for Mueller’s investigation, despite rumours that Trump has been weighing the possibility of replacing him. Rosenstein has long been the target of the president’s ire, but tensions reached a new high after The New York Times published a controversial report last month saying he had discussed wearing a wire around Trump and advocated invoking the 25th Amendment to remove the president from office. Rosenstein first raised the issues in the spring of 2017 with officials in the Department of Justice and the FBI, The Times said, citing sources who were briefed on the conversations or on memos about Rosenstein written by FBI officials such as McCabe. A Washington Post report published later described a source as saying that Rosenstein’s comment about wearing a wire was made sarcastically after McCabe pushed for the DOJ to investigate Trump. The newspaper said the source was at the meeting where McCabe’s memos say the conversations about the 25th Amendment and recordings took place, though the person said Rosenstein didn’t raise the possibility of invoking the amendment. A contemporaneous memo of the meeting created by Lisa Page, then an FBI lawyer, also did not mention anything about Rosenstein bringing up the amendment, The Post said, citing a person familiar with Page’s account. Rosenstein vehemently denied the allegations, and he reportedly offered his resignation to WHite House officials several times in the days following the article.